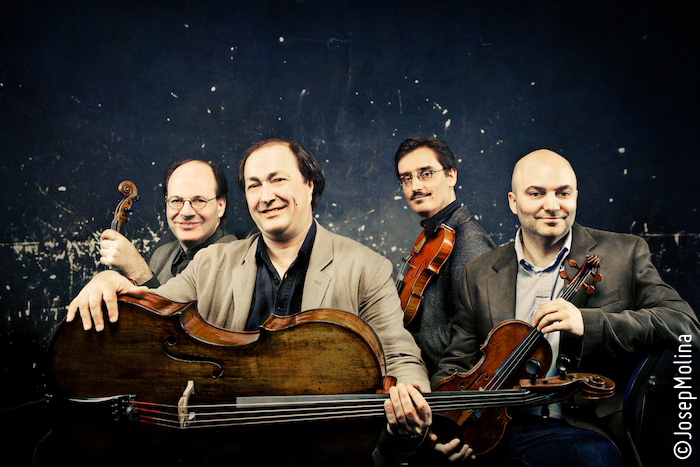 A truly international ensemble (Finnish, American, Dutch and Rumanian), the Orpheus Quartet has met with international acclaim since its founding in 1986. It has given tours through North America, Europe, and Asia both as a unit and as collaborator with many of the world’s finest chamber musicians, including pianists Menahem Pressler, Homero Francesch, Pavel Gililov, Ralf Gothoni and Ulrich Koella, and clarinetists José Luis Estelles and Sharon Kam. The Orpheus Quartet also works toward commissioning and playing contemporary music and looks to all possibilities for broadening the standard repertoire with unusual and sometimes forgotten compositions. The quartet is currently preparing a recording of works by German composers Woldemar Bargiel and E. E. Taubert, along with one of César Franck and Claude Delvincourt. The Orpheus Quartet’s recordings have been widely celebrated. In 1993 it was awarded the Grand Prix du Disque de L’Académie Charles Cros for its first recording, issued by the British label ASV, of the eight string quartets by G.F.Malipiero (a world premiere). They also received a Diapason d’Or in 1994 for their Channel Classics disc of the Schubert Quintet in C major with Pieter Wispelwey. To celebrate the release of the two Janácek quartets at Emergo Classics, the quartet gave two different concerts on the same day in the Concertgebouw in Amsterdam. The next recording, dedicated to the chamber works of the great Dutch composer Tristan Keuris, who died all too soon in 1996, appeared in 2002 with Emergo Classics and was chosen as CD of the year by the Dutch book club. Most recently, the quartet has recorded a live-concert with 4 modern instruments built for this occasion by Wolfgang Kury & Karoline Krömmelbein after models of Amati; this was released in 2009 and includes music by Haydn, Sibelius and Beethoven. The quartet also devotes much time to teaching, and gives regular masterclasses at the Liceo in Barcelona, Musikene in San Sebastian, the Savonlinna Academy in Finland. It has also been in residence at the Curs Internacional de Musica de Cervera for more than a decade. The Orpheus Quartet recently commissioned the great French bowmaker Stéphane Muller to build for the ensemble a quartet of bows; he responded with a beautiful set of bows themed on the four classical elements (Earth, Air, Fire and Water), with which the quartet has performed since 2008.
hace poo fui a ver un concierto a Lugo, porque me mandó ir mi profesor de viola, y me encantó como tocaba. Mi profesor de viola me está hablando todo el tiempo de este cuarteto y sobre todo de Emil.